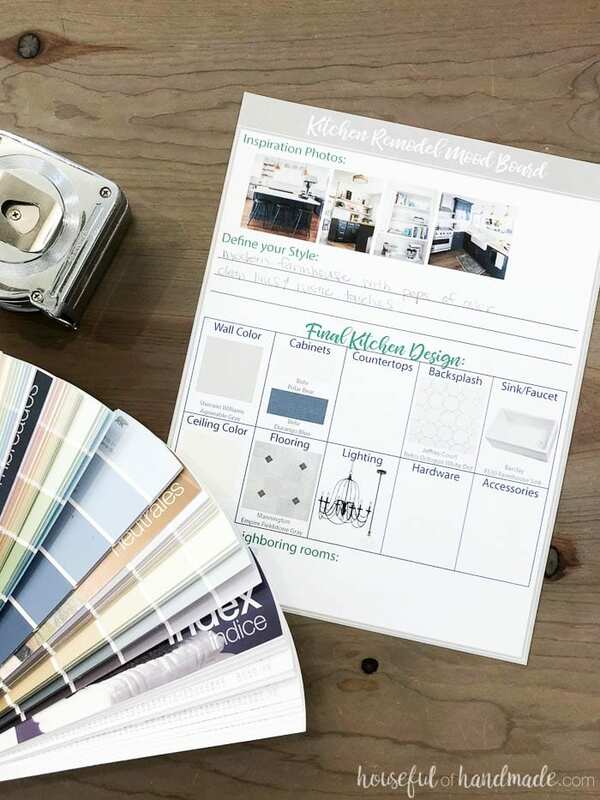 These free printable kitchen planning tools will help make a kitchen remodel much easier. There are so many aspects to a kitchen renovation. 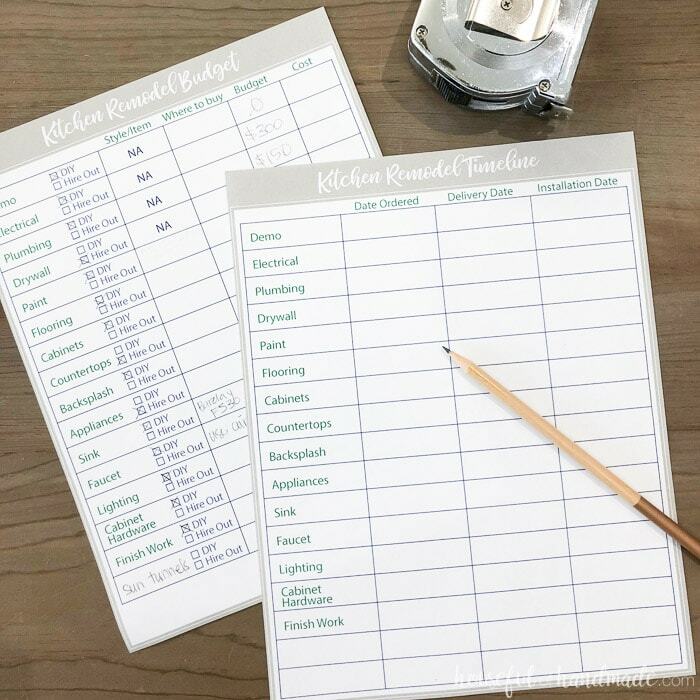 Use these printable renovation planning sheets to stay organized. We are in complete kitchen planning mode at our house. I have spent hours and hours researching, looking at swatches, measuring and figuring costs. And as I was trying to make the final decisions, I realized I needed somewhere to organize all my thoughts and ideas. So I created these kitchen remodel planning worksheets to make life a bit easier. Using kitchen planning tools is saving me from forgetting key parts of the big remodel. 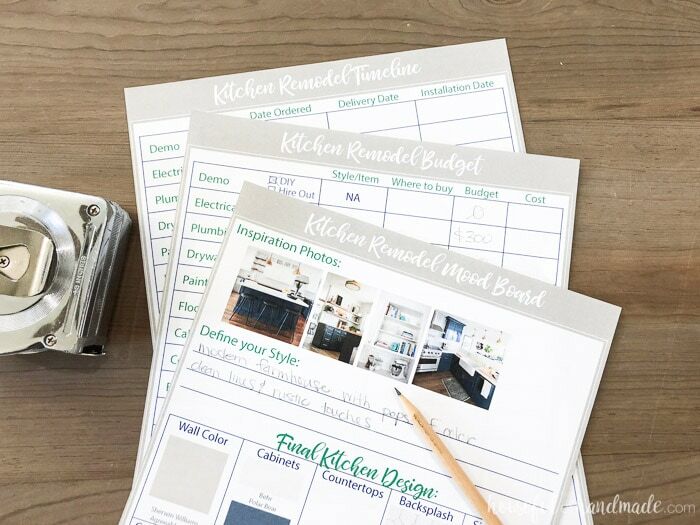 For these kitchen planning tools, I am organizing 3 different aspects of the kitchen remodel: Design, Budget, and Timeline. Of course, kitchen layout is important, but I find that is best figured out on a piece of grid paper or with a design program like SketchUp. For the kitchen design planning, honestly I could have an entire 3-ring binder full of ideas and products and inspiration. But I know that the more choices I have, the harder it will be to make decisions. So instead I am keeping it simple! There is a small space for 4-5 inspiration photos. I picked photos with the overall feel of the space or specific design elements I definitely want to incorporate. Then right below it is a space to define your style. I think this is important so you can make sure that all the elements you choose fit into the style so your entire room flows. Also, as I make my final design decisions on the kitchen remodel, there is a place to add pictures or swatches of each element. I love being able to see them all together (and with the colors from the neighboring rooms) so I can make sure I love the way it all looks. And can I say… I am so excited!!! It is looking great! While I am making my final decisions, I have been researching each element. It is hard to set a budget without an understanding of what each thing costs. I was seriously shocked when I started researching farmhouse sinks! They are quite pricey for my very budget conscious. But since they are one of the elements I absolutely want (and are such a statement), I am making room in my budget for it. Also, I am hoping that I can find a lower priced option for other elements to help make up for the added sink cost. When setting a budget for any remodel, I like to start by doing a bit of research and then picking my favorite option in each category. I set a budget for that and add it up. Then if the total budget is more than I planned, I can pick which elements I am not willing to so cheaper and which elements I am. Once I find what will work in my budget, I can finalize it all. I also include a place on the budget sheet for you to put the actual cost. This way you can see if anything was over budget so you can continue to make adjustments as you progress through the remodel. DIYing parts of a renovation is a great way to save lots of money! I am picking elements for our kitchen that I know I can do myself like the floating vinyl floor, tiling the backsplash, and even building the cabinets. Then we will have more money in the budget to hire out the things I cannot do like installing quartz countertops or for the things I hate doing like drywall. Currently our entire kitchen renovation budget is set for $20,000. This is a big number and way more than most of our remodel projects. But we are completely gutting our kitchen, removing a drop ceiling and 2 awful pantries, adding 16′ of kitchen cabinets. And since the space is open to our dining room we have to include elements of that room in the remodel as well. I will be sharing the budget details of this remodel with you as well because I know that is such an important thing to consider if you are looking to do your own kitchen remodel. Also, always add a contingency to any remodel budget. You just never know what you will discover when you open a wall (we found mold in our master bathroom when we opened it up). Or if you need to hire out something you were not planning because you get in over your head. Plan for at least 10-20% contingency budget to give you a little wiggle room in the budget. And if you don’t need it, then you will come in under budget and that is always a good thing! 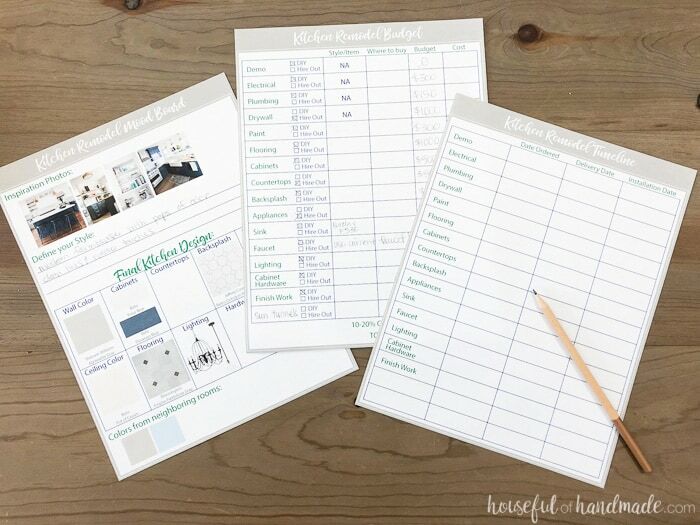 The last part of the printable kitchen planning tools is the timeline. When you are DIYing a kitchen remodel, there will be a lot of parts to keep track of. This page is perfect for documenting order dates, delivery dates and install dates so you can keep everything on track. This will help prevent anything from falling through the cracks. Our kitchen remodel timeline is currently set for 6 weeks! That is a tight turnaround but I really want to be without a kitchen for as little time as possible. Luckily, we have our outdoor kitchen and dining room ready to go so we can use it during the remodel and still enjoy our family dinners (when I am not too tired to cook). Also, I am planning on relying a lot on my instant pot! Seriously if you haven’t tried one, you are missing out. I love that I can sear and then cook right the same pot so if my stove is unavailable, all I need is a plug to make a real home cooked dinner for the family. 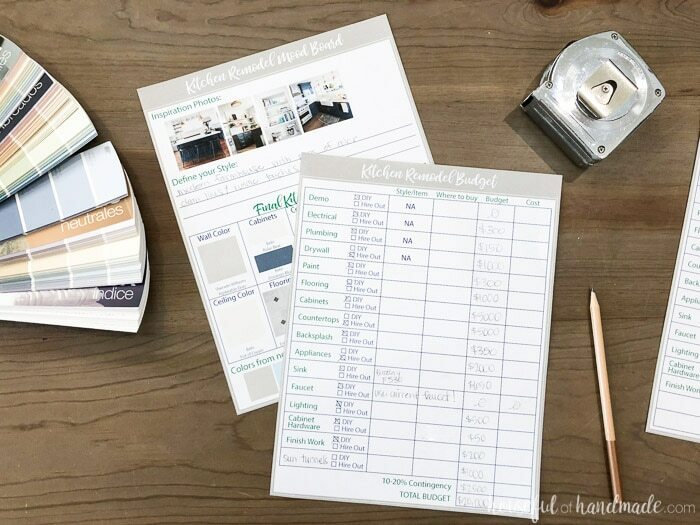 I am sharing all three worksheets of the printable kitchen planning tools in my subscriber library. Click here to subscribe to my weekly newsletter and gain access to all the freebies. If you already have your password, click here to download them. I hope you will enjoy following along our kitchen renovation journey. We are planning on including a lot of videos to help share the real process with you. And if you are hoping to remodel your kitchen soon, hopefully we can help make your life easier with these kitchen planning tools. Hello Lynn! I include the password in the bottom of each weekly newsletter (usually sent on Thursday) just in case you ever forget!